The Trent University Library is pleased to offer Trent University Alumni Association members borrowing privileges at no charge, at both our Bata and Durham Branch locations. Access to our licensed online resources is restricted, based on individual agreements with suppliers. Some suppliers allow Alumni access, while others do not. We do our best to obtain Alumni privileges to online resources whenever feasible. Use Databases A-Z to find licensed resources available to Alumni. A blue lock icon: indicates Alumni access, and you can limit your search to those. A grey open-lock icon: indicates free/public resources, and these are also available to Alumni. The Library works with the Alumni Association to ensure only valid Trent Alumni are using restricted resources; the Alumni Association database is used for this purpose. When you connect to an online service, you'll be asked to login with your Trent email username and password. Information on how to obtain a new account, or reactivate your old account, can be found on the myTrent portal under the myTrentCommunity section. 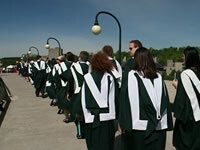 Trent Alumni have the same privileges in the Archives as current Trent students. This includes reduced photocopy charges.